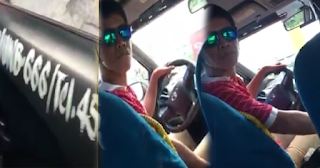 Controversial: Beast Mode Taxi Driver Trends on Social Media! Must Watch! This incident was filmed by Joanna A. Garcia. According to her, they had a very bad experienced with this taxi driver his plate number is UWB666. You could clearly witness in this video how he is in attending to his passengers. Joanna said that before they take on the ride with this taxi, driver and her both agreed that they will pay by meter which is the standard measure for payment, but then when they reached the location and meter only reaches 140 php she gave 200 php expecting for a change at least 50 php, then this is where the driver started shouting and asking them to leave his taxi in a very rude way. She added that this driver hit her in numerous times when he saw that she was taking video of him, Just to drag them out of his taxi the driver shouted a lot of bad words and almost harass them.When they moved out the taxi the driver followed them and wants to hit her face, but with the help of many people around the scene, the driver immediately run. Joanna thinks that the driver is under the influence of drugs because of his abnormal reaction. This case was already reported in the authority. People are advised to give extra careful and be alert all the time whenever they are using public transportation. And for as much as possible report any incident that you may encounter. look at the plate number, its illuminate or sign of the demon and the demon was the driver obviously.